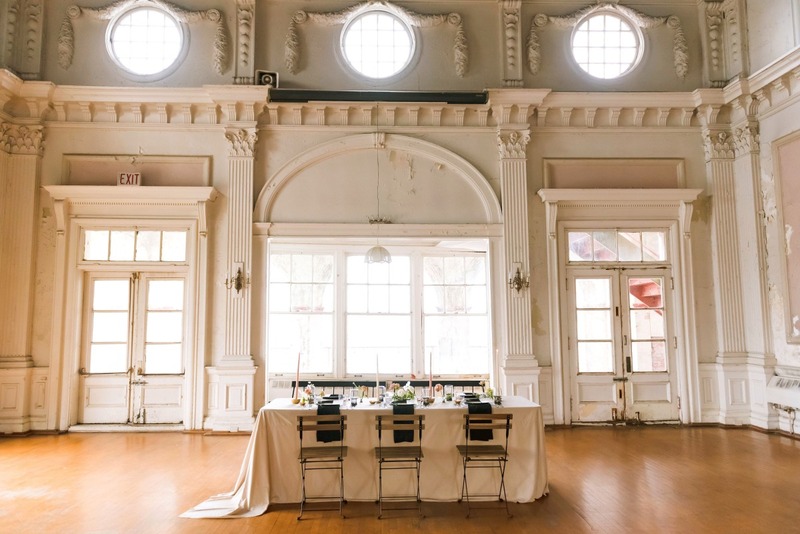 Simple and sleek, this vintage wedding venue gets a modern makeover for a wedding day filled with as many juxtapositions as the location it has been staged. 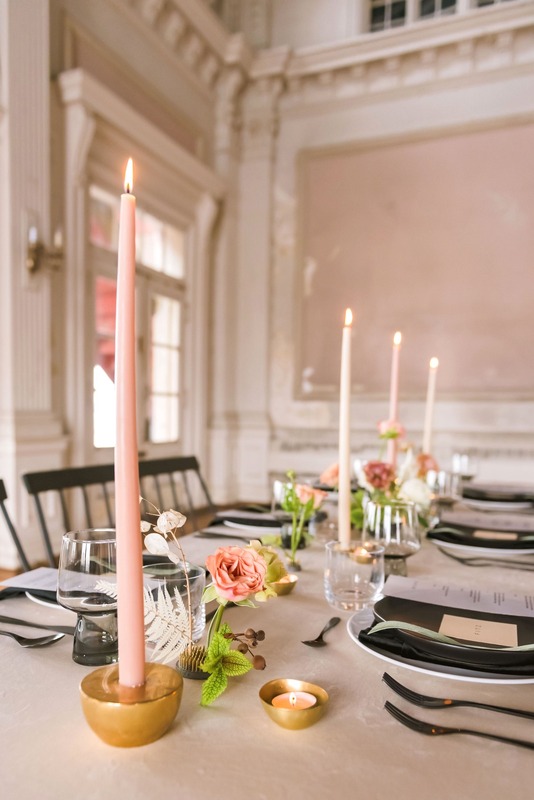 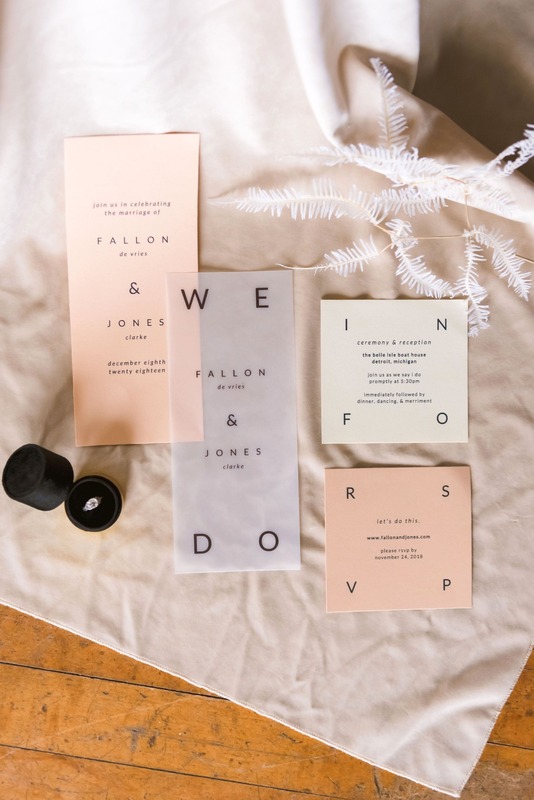 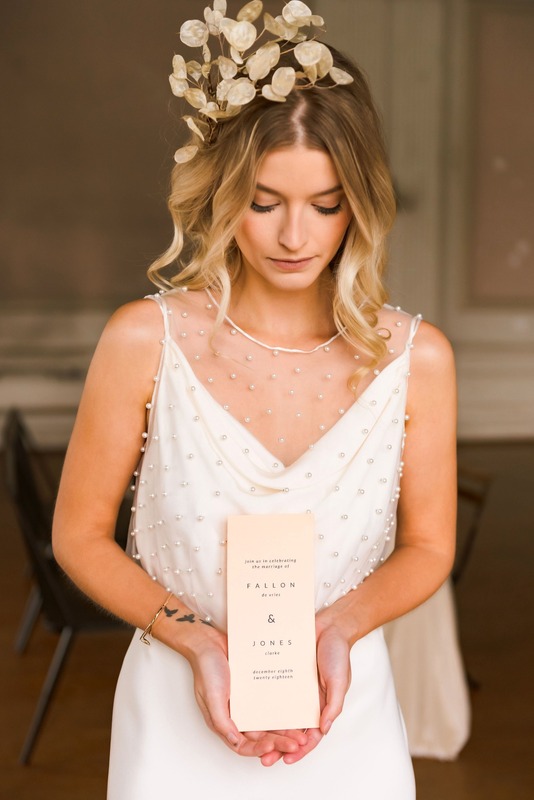 A lovely push and pull on both a minimalist modern vibe and a look back on the romance of years gone by, this wedding inspiration by Modernly Events plays with both beautifully. 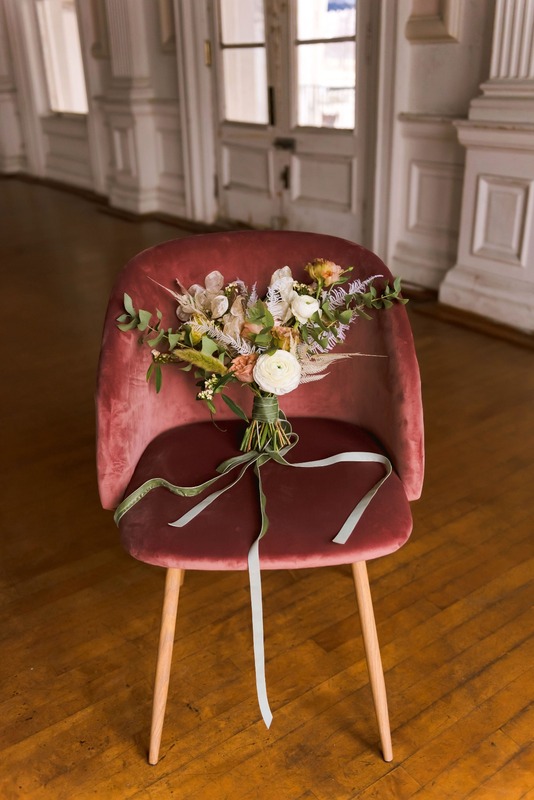 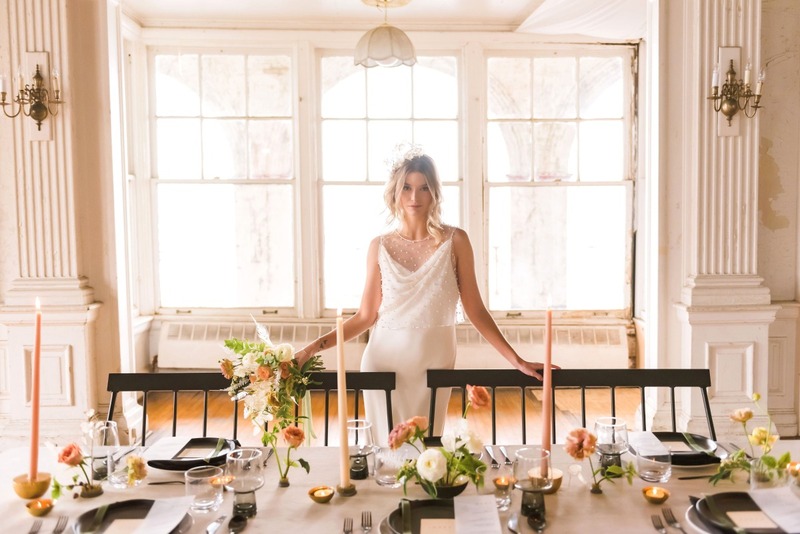 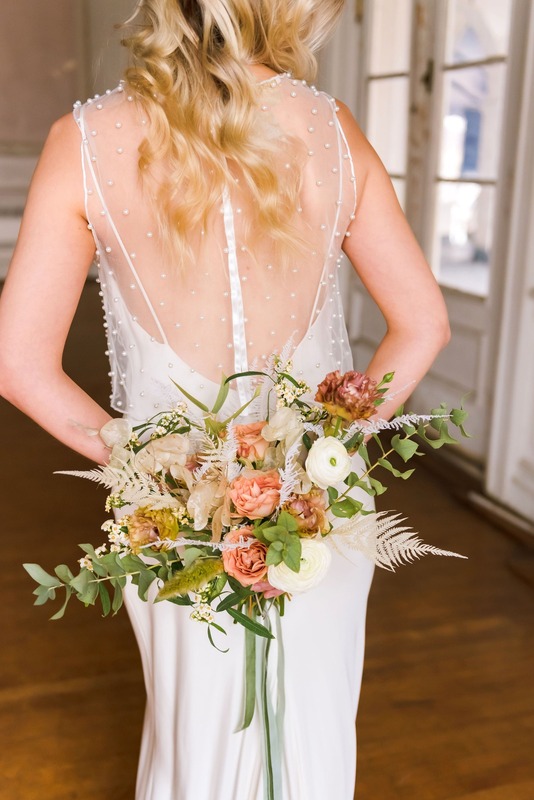 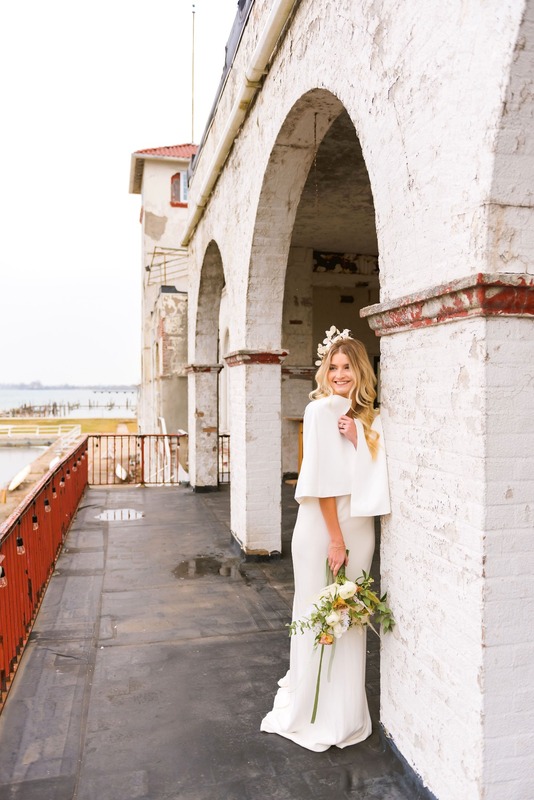 You can see more of this vintage minimalist wedding, photographed by the talented Erin Schmidt Photography, in our full gallery below. 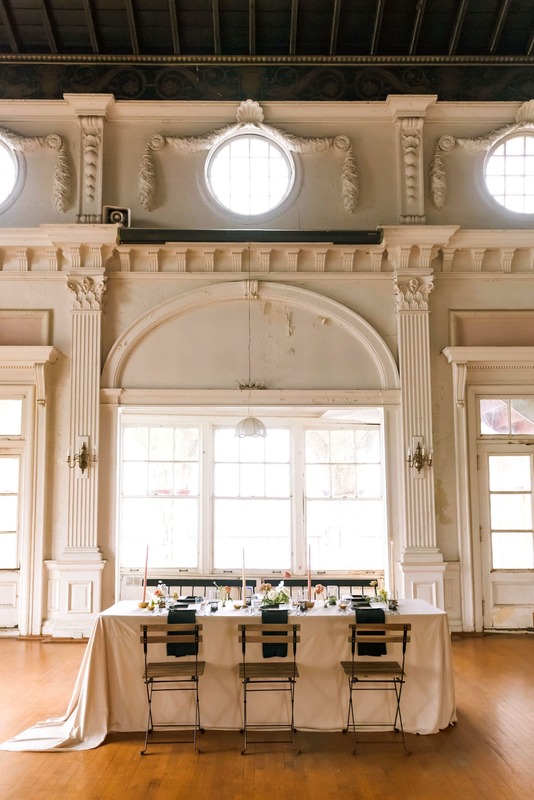 By focusing on a more neutral color palette and clean lines while layering in velvet, matte, and semi-opaque textures, we allowed the ballroom’s classical ornamentation to be its own moment without feeling overdone or overpowered by our design. 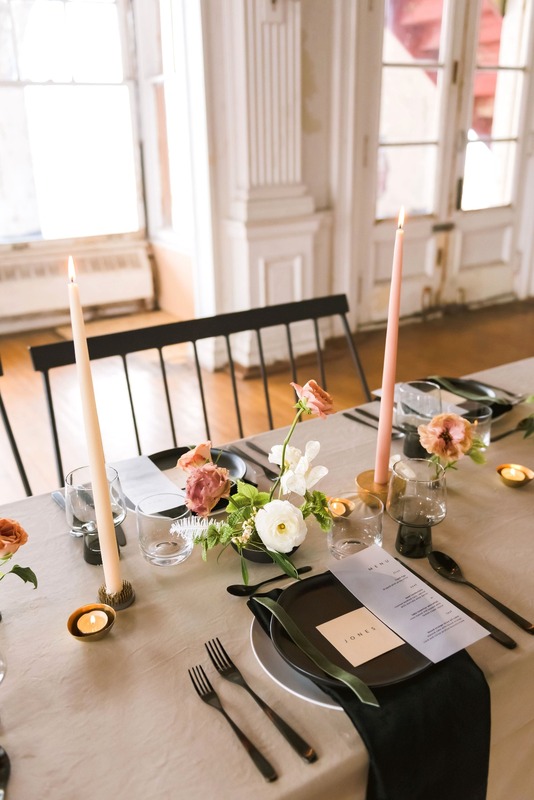 Fatima (Studio Terrain) kept the floral arrangements super clean and minimal by arranging fresh flowers, dried lunaria, and bleached Japanese fern in an ikebana-inspired style using low black bowls and vintage flower frogs. 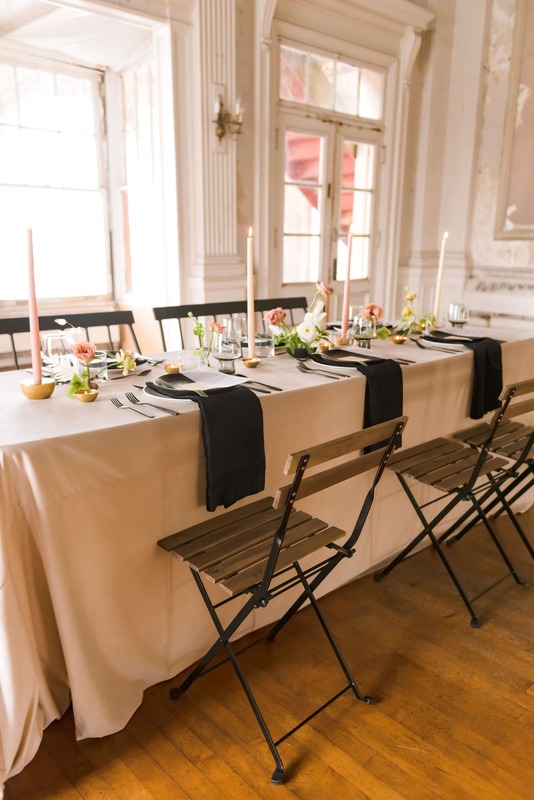 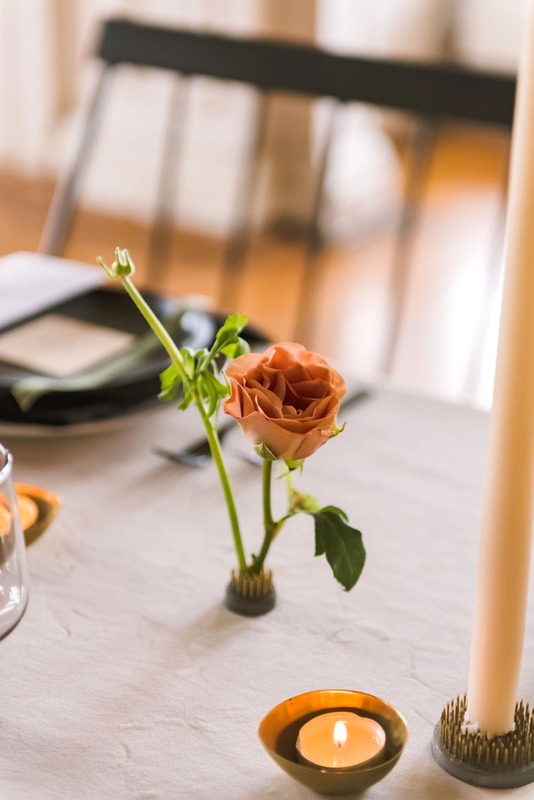 We also kept the tablescape design minimal by using matte black dinnerware and flatware, vintage smoke glasses, and layering rich black velvet napkins on top of an oatmeal-colored velvet tablecloth from La Tavola Linen. 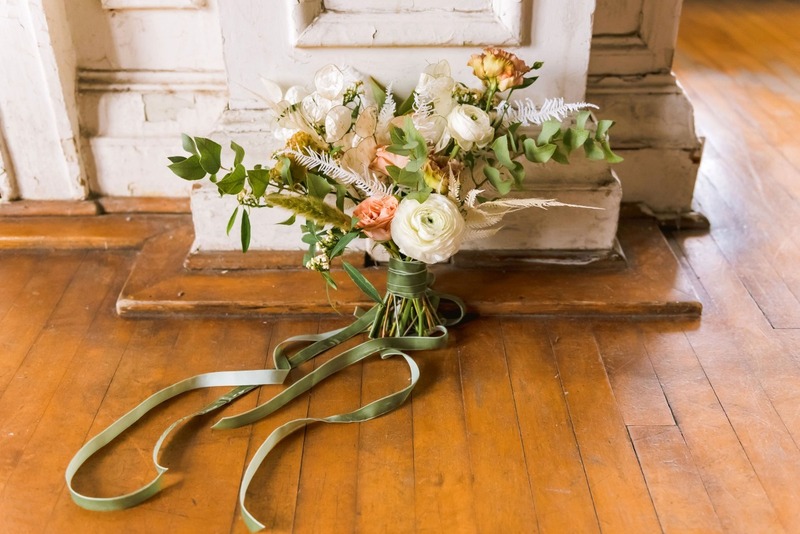 Our original green velvet ribbon inspiration made an appearance as part of the place setting to complement the menu and place card, and as the bridal bouquet wrap. 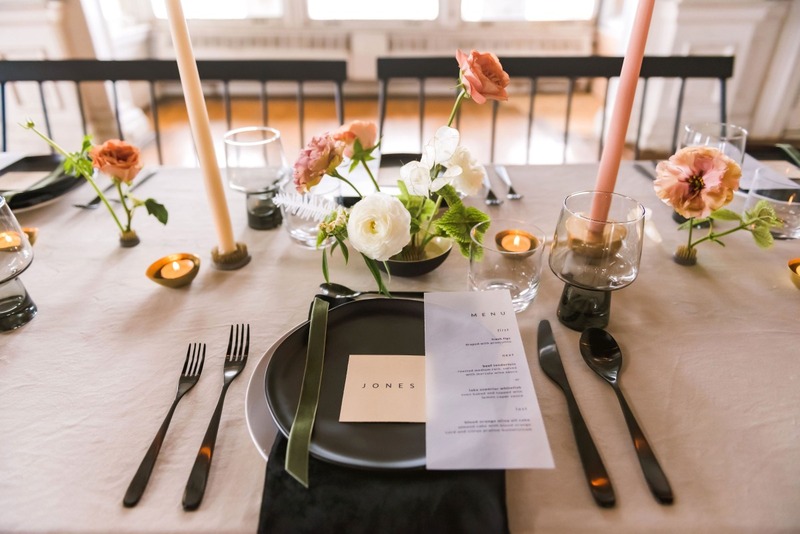 The delicate and semi-opaque qualities of the dried lunaria were carried into the stationery by using vellum paper as an accent in the invitation suite and for the menu cards. 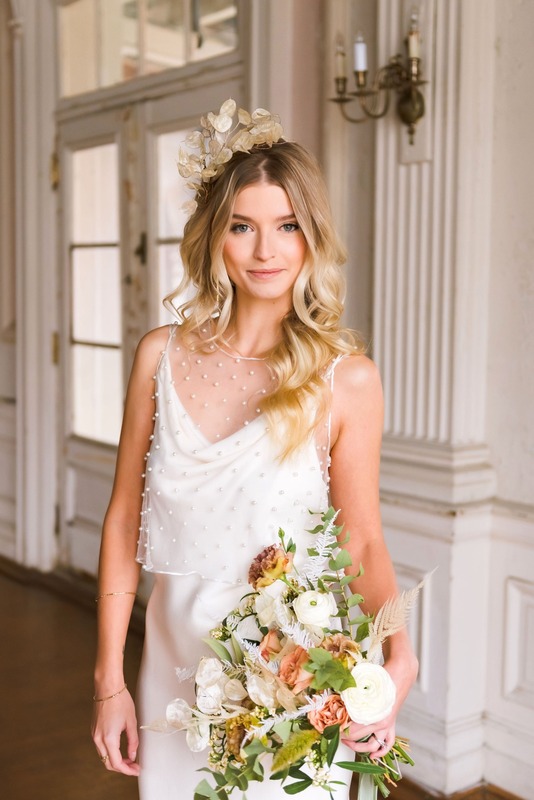 A cascading dried lunaria headpiece completed the bridal look with a bit of whimsy and tied it into the rest of the wedding design. 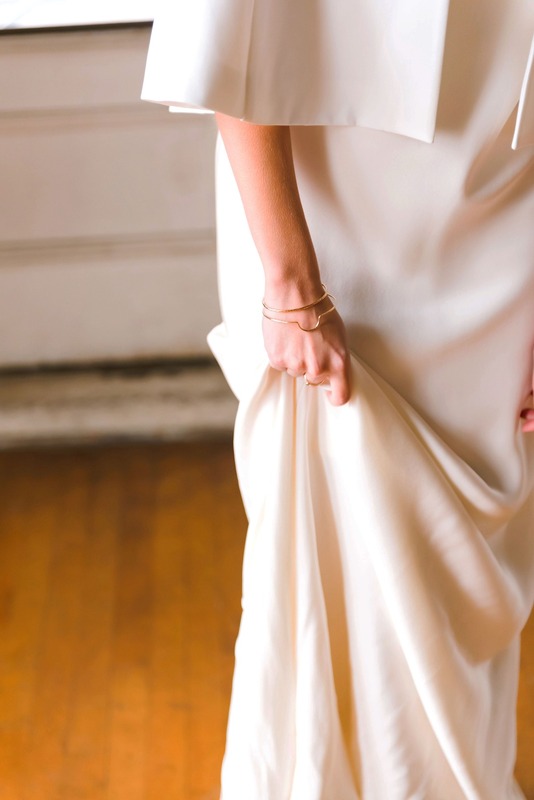 The bridal look also played with the minimal and classical design juxtaposition. 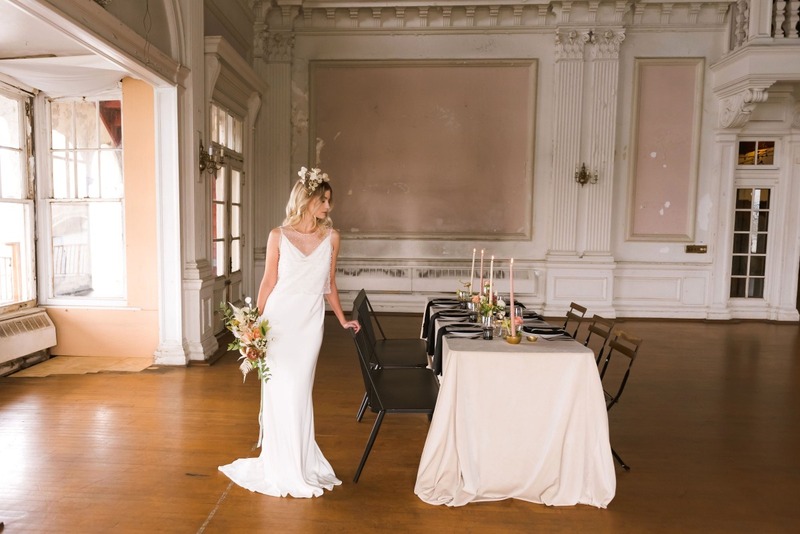 We paired a sleek Sabina Motasem crepe gown with a sheer pearl-studded Jenny Yoo topper for a modern feel with a nod to classic bridal looks. 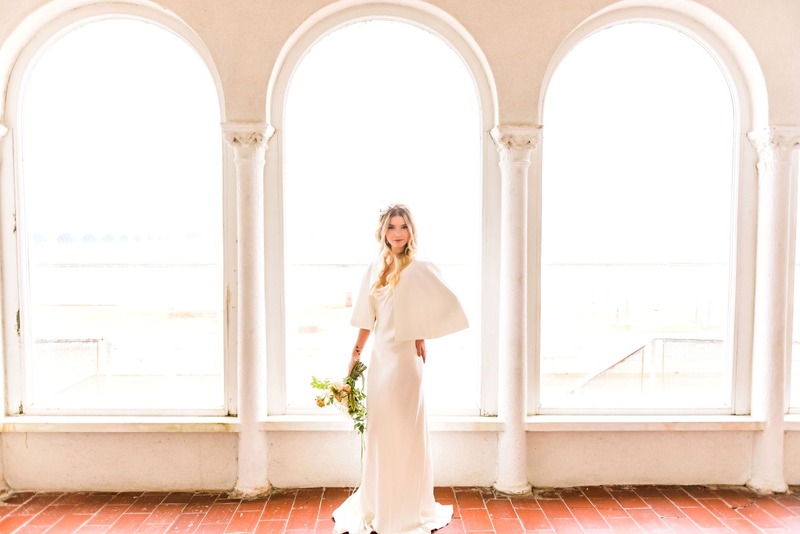 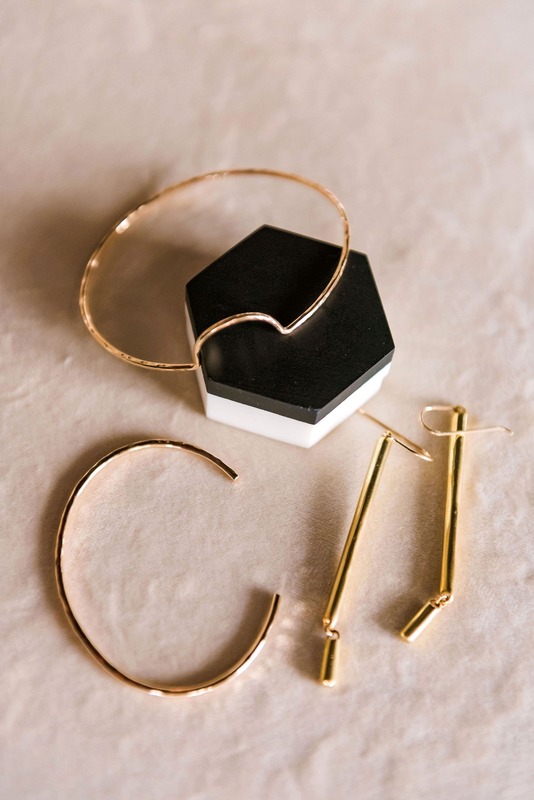 Delicate jewelry handmade in Detroit, dewy makeup, and an outfit change into a modern cape with sleek lines added to the modern minimal bridal look and feel.